Syncing data between Mac and Android can be a real headache as there are no built-in solutions that can connect and transfer data between these devices. 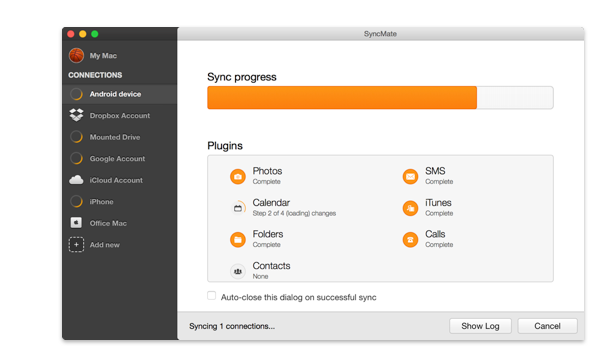 SyncMate fills this gap and gives you full access to data synchronization between Android and Mac. No matter which phone model you own, if it runs Android 4.x-9.x SyncMate will sync data on it with Mac and vice versa. Below are the usage scenarios for the most popular devices. And we can prove this! SyncMate offers you unique possibility to sync almost any data in your Mac with your Android directly. No need to use third-party storages or apps, SyncMate will sync data directly between macOS and Android native apps. So, let’s start with Free Edition of SyncMate. Tired of double entering the same contacts and calendar entries on Mac and Android phone or tablet? Enter them once - sync them with SyncMate! Just connect your Mac and Android device and sync Contacts and Calendar for free! Depending on data volume the duration of synchronization can vary. We value your comfort and do not want SyncMate to distract you from current tasks while data is being synced. So we taught SyncMate to work in the background. If syncing contacts and calendar events is not enough for you, we’ve got SyncMate Expert Edition that syncs any (we mean any) data between your Mac and Android. Music, images, playlists, bookmarks and folders - you are not limited in what you can sync between macOS computer and Android using SyncMate Expert. By mounting your device on your Mac you get the easy access to it through Finder and can manage its content the same way as any regular computer drive. Add as many files to your folders as needed and sync them for easy access. No copying or moving anything manually when you have SyncMate. SyncMate Expert gives you a unique possibility to sync playlists or music folders between Mac and Android. Sync your favorite images and videos between Mac and Android and share them with your friends on the go! Receive, create, delete and even export your text messages to file on your Mac with its convenient full-size keyboard. SyncMate gives you even more and allows syncing data automatically and in the background. Moreover, you can backup Android data on Mac with SyncMate Backup plugin. Did we mention you can view Android call history on Mac? You can! So, which data can be synced between macOS and Android? 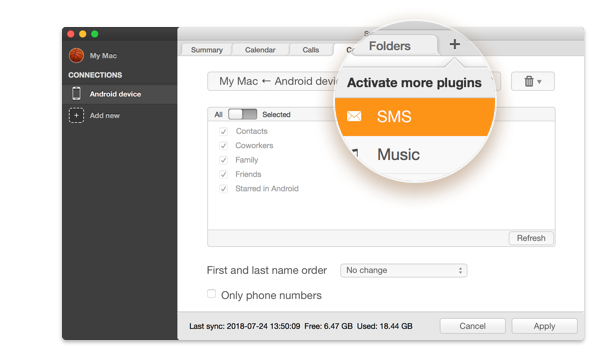 SyncMate gives you a huge variety of options to synchronize Mac and Android. Check the list below to learn more about sync directions for each plugin. 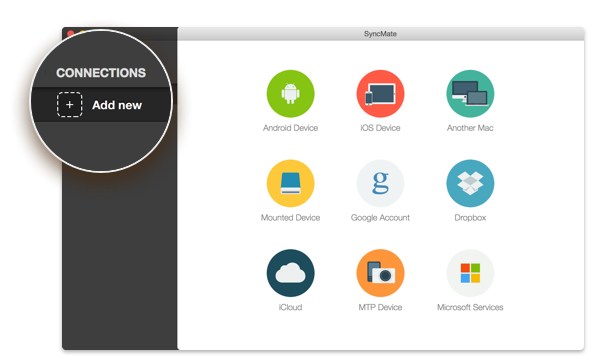 Below we put together the full list of options SyncMate offers for Mac Android synchronization. Bet you’ll find what you were looking for. Sync contacts b/w Mac and Android Thanks to SyncMate whenever you update contact information on either side - Android device or Mac - you'll get the latest version on the other side in no time at all! Sync calendars b/w Mac and Android Whatever event you created when you were behind your desk or on a hike, it will be synced as soon as your devices can "see" each other. Mount Android as Mac disk You'll have instant access to your photos on any of your devices once synced with our app. Every newly added image will be updated on each synced device. Synchronize photos You'll have instant access to your photos on any of your devices once synced with our app. Every newly added image will be updated on each synced device. Sync music between Mac and Android Isn't it wonderful news that whenever you discover new music and get it on your phone or Mac it will appear on synced devices without any effort on your side? Sync folders b/w Mac and Android Instead of copying files and folders from one device to another just set SyncMate up to synchronize them and keep the latest versions for you. Sync Safari bookmarks with Android Your bookmarked pages in Safari browser on Mac can be synced to your Android 3.х-5.х device for effortless access at any time. Sync Android playlists with Mac SyncMate will take the best care of your iTunes playlists by keeping them updated between Mac and Android devices that you take with you on adventures. Manage Android SMS Switching back and forth between Mac and smartphone can be hectic. With SyncMate you can read, send, delete, and export texts. Back up Android on Mac This option is an obvious one. You should never go without backing up your work files or family photos or other important stuff really. Sync Android and Mac automatically You get to choose what data to sync between your Mac and Android, you also get to choose when. But the most convenient thing - SyncMate can do it all automatically! Manage Android calls history on Mac Manage your incoming, outgoing, missed calls on your Mac's screen with all essential info: number, photo, duration, time and date. Export to file is available. I’ve heard that direct Mac to Android sync is impossible. How did you do this? Yes, Mac synchronization with Android by native Apple services is impossible. But SyncMate goes beyond and offers its own sync service that makes data sync and transfer between macOS and Android possible. We did a great job and hope you will like it! I need to access Android folders on Mac - can I do it? Yes, you can. Not only SyncMate allows syncing data between Mac and Android, but also gives you an opportunity of mounting Android as Mac disk (Mount Disk option). In such case all user folders of your Android (internal and external storages) will be shown in Finder. I need to sync data between Mac and Android but do not want to use Google storage. Will SyncMate assist? Data security - that what we care the most when syncing. SyncMate doesn’t share your data with any third-party services. Sync is performed directly from macOS apps to Android and vice versa, so you can be sure that your data stays with you and doesn't flow outside of the stream. How can I be sure that my model of Android phone is supported? No matter which model of Android device you own, if it runs Android 4.x-9.x - SyncMate will sync it with your Mac. SyncMate works with OS, not with phone model itself. Why should I get SyncMate instead of other sync tools? There are not so many apps to sync Mac with Android presently. However, to assure you that SyncMate can be the best option for you, we put together the list of key features that differentiate SyncMate among its competitors. It has its own sync service that makes Android data transfer to macOS (and vice versa) possible. SyncMate doesn’t use any third-party apps or storages to sync data, so you can be sure your data is safe and secure. SyncMate doesn’t limit the quantity of devices you can connect and sync with Mac. SyncMate is probably the only app that supports such a wide range of data. Can SyncMate replace Android File Transfer? It is safe to say that SyncMate is a great Android File Transfer Mac replacement providing you with more options than the latter. Not only can you move data back and forth on Mac and Android (mount your phone on Mac as a disk and manage in Finder), but also sync data between computer and device. So if Android File Transfer not working with your devices - SyncMate can be a solution. How many devices and accounts can I sync with Mac using SyncMate? 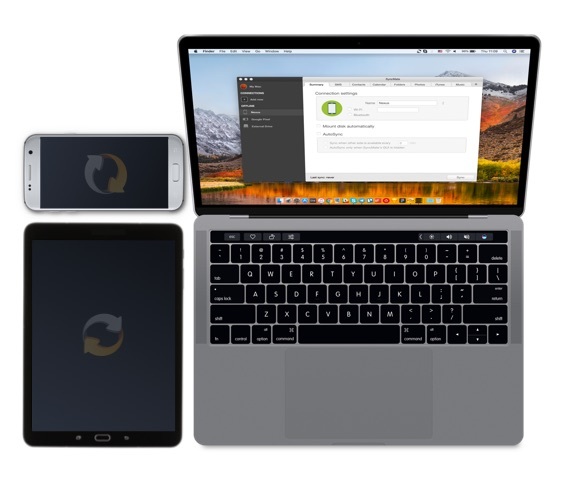 SyncMate doesn’t limit the quantity of Android phones and tablets you can connect to your macOS computer and sync. Can I sync Mac with Android if there is no Internet connection? With SyncMate you can sync Mac with Android wirelessly (Bluetooth or Wi-Fi) or via USB, so even if there is no Internet connection, your data still can be synced via Bluetooth or USB. Is there any integration with Android apps or is data just stored on device in a separate folder? SyncMate offers you full integration of all apps in macOS and Android. This means that if you are syncing contacts between Mac and Android, they are synced between Address Books, media is synced directly between Photos and gallery on Android and so on. Why should I use SyncMate if I have Google services? Roughly speaking, SyncMate does almost the same that Google services do. SyncMate's strong suit however is the flexibility it offers while syncing. With SyncMate you can choose which exact account or device should be synced, while Google services update data across all devices within your Google account. SyncMate allows you to choose which folder or group of contacts you need to sync, Google services don’t. With SyncMate you can choose sync direction for each plugin - Mac to Android, Android to Mac, or bi-directional. With Google services you can’t. Syncing data between Mac and Android using SyncMate takes minutes. We mean it! Below are easy steps that will guide you through Mac Android synchronization. Once SyncMate is installed and launched, choose Android device in SyncMate Wizard and connect it to your Mac. When Android is connected, choose data to sync and set sync parameters if required. That’s all. Click “Sync” button and see how SyncMate will do all tedious sync job for you. How to fix Android File Transfer?